If you're a regular reader of my blog, you'll know we've been patiently awaiting the arrival of our second baby. Well I can now happily announce that our yellow bump turned blue and he's absolutely P E R F E C T! 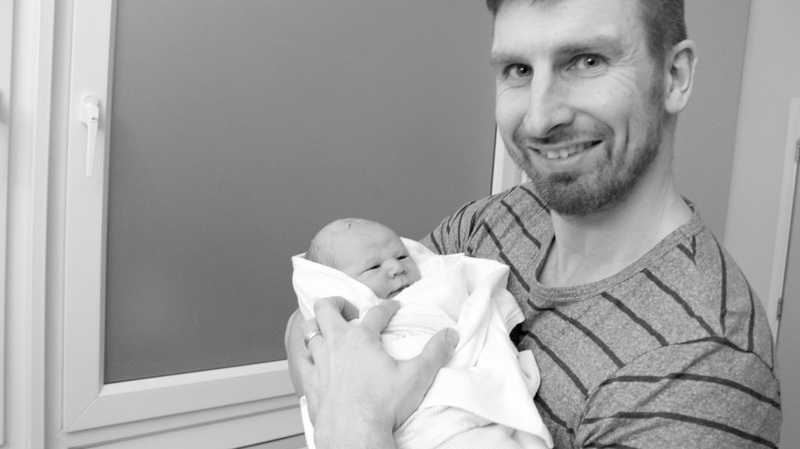 Freddie Joseph Thompson arrived on Wednesday 25th February 2015 at 5:06am after an amazingly quick labour and delivery. He weighed a very healthy 8lbs 6oz. Just like his big brother, he was a very kind 3 days early. I would hate to go overdue and I really feel for ladies who do. Those last few weeks are such a drag! Words cannot describe the love I have for this little boy. You think you can't love anything or anyone as much as you do your first born, but the as soon as I laid eyes on Freddie that same love just hit me. I can't believe he's here and how lucky I am to have 2 beautiful sons. Don't worry, I won't go into graphic detail! On the Tuesday (24th) I went about my normal day to day activities; I went to the shops with George, came home and cleaned my house from top to bottom with the help of my Mam (thanks Ma). Clearly I was nesting, I should have known then that he was gonna make an appearance very soon. We had a pretty normal evening; had tea, baths, put George to bed etc. and I settled down with an episode of Call The Midwife (lol) whilst Martin watched the football. It wasn't until I was ready for bed that the pains started. Typical, I know. The exact same thing happened with George. Your body waits until you're completely settled and ready for a good night's sleep and then BAM. So it was around 11pm when I started getting strong braxton hicks contractions. I'd been having them pretty regular towards the end of my pregnancy, but these ones started getting that little bit more uncomfortable. I didn't wanna get my hopes up that they were anything significant so we went upto bed. By about 11.30pm the pains started getting stronger and more regular. I did start to think this was the real thing, so I took some paracetamol in the hope that I could get a couple of hours sleep. By Midnight they were getting stronger and seemed to be regular and I realised I wasn't getting any sleep so we both got up and went downstairs. Martin made me a cup of tea and I had a good bounce on the birthing ball as it seemed to help with the pain. At this point the pains were getting seriously intense and regular. I downloaded a contraction timer and began timing each contraction. It was crazy how fast things got moving, as around 1.30am the contractions were coming every 2-3 minutes and lasting around 40/50 seconds. This, compared to my last labour was just ridiculously fast. It felt like my body didn't have time to get used to the contractions as they just hit me like a tonne of bricks. I tried to tell myself that I could cope a little bit longer as I didn't wanna go into hospital too soon only to be sent home again like I did last time so Martin ran me a bath at about 2am and I sat in there for 20 minutes. It seemed to help a little bit but I still felt as though I was losing control a little bit. When I got out of the bath we rang the hospital and told them how far apart the contractions were and they told us to come in right away. Martin got on the phone to his Mam (bless her), who had said she would be on call incase we needed her during the night as we had George and Martin's older 2 children in bed. She arrived at around 2.40am and we set off for the hospital straight away. When we arrived at the hospital (around 2.50am) I was really struggling with the pain. Luckily we passed a couple of nurses on the way in who offered me a wheelchair and helped us up to the delivery suite. When I got up there I was greeted by my midwife (who was amazing by the way), and she took us into our room. After a couple of horrific contractions which resulted in me being on my knees by the bedside, I managed to climb up onto the bed so she could examine me. To our huge surprise, she informed me I was already 8/9cm dilated. I could not believe it! I was shocked but absolutely amazed and slightly proud that I'd managed to get that far at home. I was given gas and air and she told me that my waters would probably break within the next hour or so - but they didn't. She asked if I'd like her to break my waters and I immediately said yes as I just wanted to get things going and moving as quick as possible. Gas and air is the strangest feeling ever, I definitely find it helps through the contractions, but it does leave you feeling slightly drunk/woozy so I don't like to overdo it. Once my waters had broken, things began to really get serious. The pains got so much worse but I was coping (just about) with the gas and air. Martin was so good with me, giving me water through a straw and holding my hand through each contraction. I did think I was losing it at one point, but Martin and my midwife were so good and reassured me that I was doing brilliantly. By around 4.30am I felt the urge to push. I'm not gonna lie, it was complete agony, but with their help I got through it. It's amazing what the body can do. It takes over and you've got no choice but to go with it. For the last couple of contractions my midwife took the gas and air from me and told me to put my all in. At 5:06am, after a few screams/grunts, Freddie entered the world. I know it's a cliché and people always say it, but the pain instantly disappeared. It's the most amazing feeling of relief when the body plops out (lol). Martin got the wonderful job of telling me we had a beautiful baby boy, as well as cutting the cord. He looked slightly grey/purple when he first came out but apparently that's normal and he soon gained colour. He had a good set of lungs on him and had a good scream on my chest whilst the midwife dealt with my placenta and paperwork etc. After a long cuddle and some skin to skin, he was weighed and wrapped up for a cuddle with Daddy. I definitely think this labour was more painful than last time, but I dunno if it's because last time was 26hours so my body had time to adjust to the pains, or that I've just forgot how bad it was, ha. All I can say is that it all is forgiven. Freddie - you were completely worth it. I can't even tell you all how smitten I am. I can't believe how much I love this little person. Like I said, I never thought it was possible to love anyone as much as I love George, but it is 100% possible. It's instant. I'm so happy with my family right now. George has taken to his new little brother like he was always here. - he doesn't really make a fuss of him but does find it funny when he cries. I don't think it's affected him that much apart from being slightly clingier towards me, which I think is only natural when he's used to having me all to himself. I'm sure you'll be seeing a lot more of my 2 boys if you follow me on Instagram, and I'm hoping to include a lot more parenting/lifestyle posts on here. 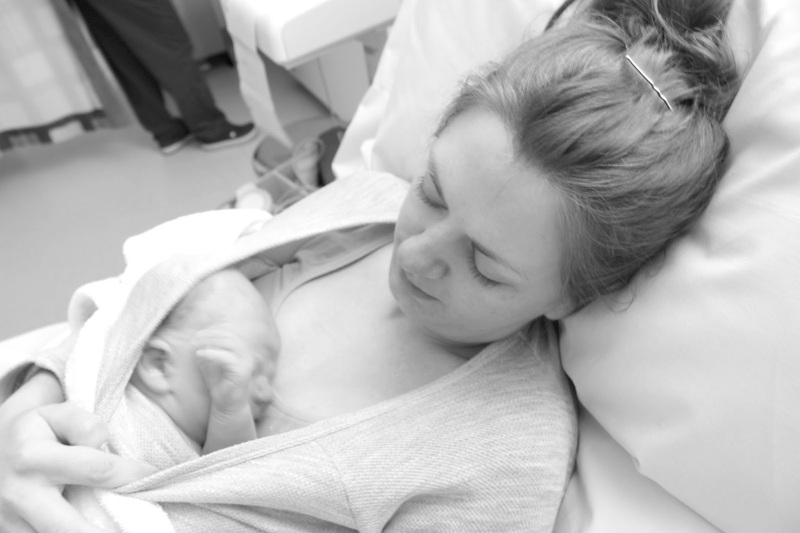 I hope you enjoyed this very wordy post, and hope my quick labour story has given hope to all you second time Mums who had a long first labour.